An Hour and Half for a Crown? We get lots of new patients of all ages in our office. Many need treatment while others do not. Some need fillings. Some need root canals. And some need crowns. For those patients needing crowns, we often describe the process, which includes the fact that we sometimes schedule for an hour and a half. “An hour and a half?? That is the response we sometimes get. Some cannot understand why it would take that long. The irony of this situation is that we are often replacing a poorly done crown that had been done in less than an hour. 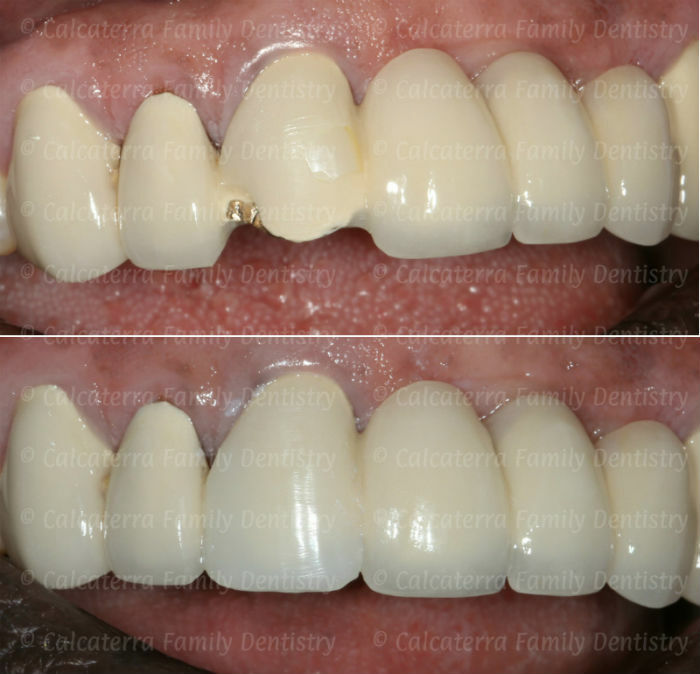 Before and after photos showing a crown on a single upper central incisor. We think the extra time was worth it. Can you tell it is a crown? Photos and dentistry Dr. Nicholas Calcaterra. The above photo shows a crown that took 90 minutes. 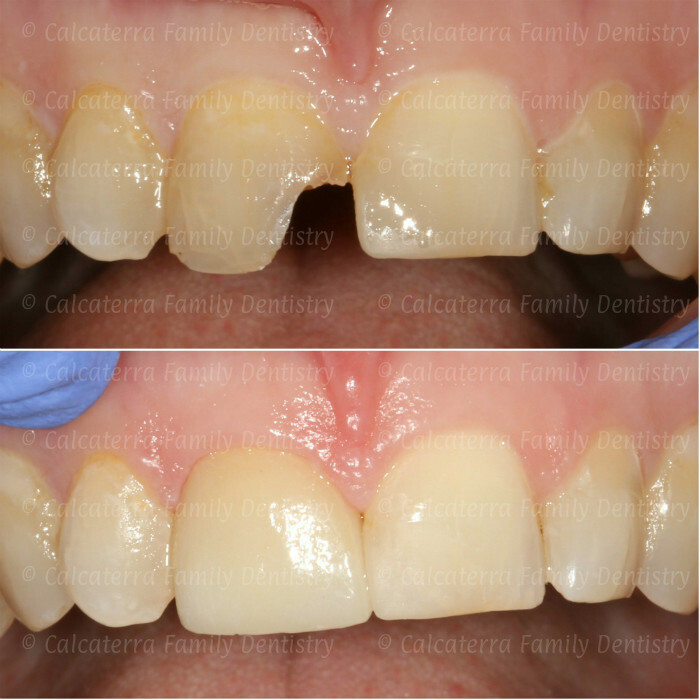 She had two very large fillings in her upper right central incisor that were consistently breaking every 6 months. We had to prepare the tooth very conservatively (which means we went slowly) to prevent her from needing a root canal. 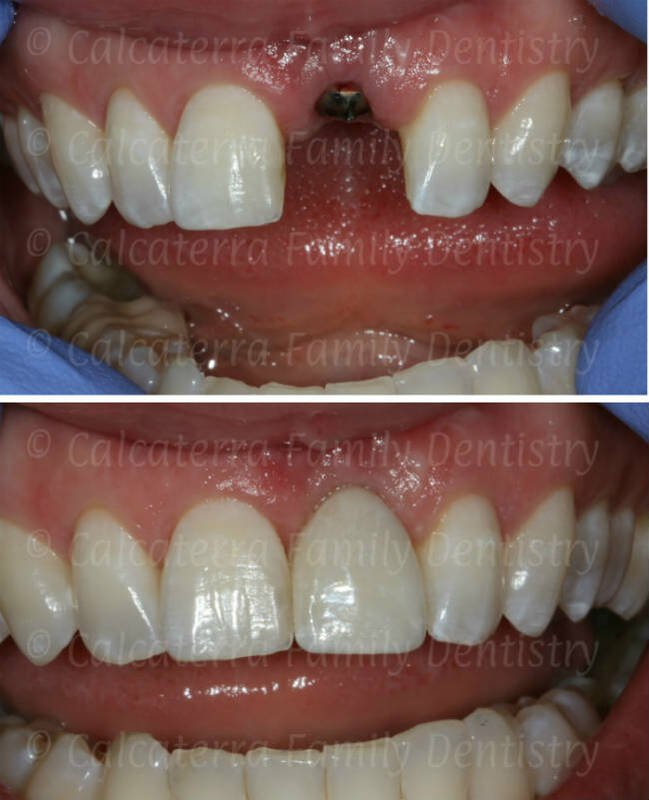 We had to create space under the gums for the crown to go. Notice how you can’t detect where the crown meets the tooth! We had to get an ideal shade match.This takes time and expertise! Notice how the shade matches the other teeth perfectly. We had to make a good looking temporary crown. Needless to say, our patient was very happy with the results. Time well spent! We thought we would include photos of crowns that were not visually pleasing. We did NOT do these crowns. Both patients recalled being in the chair for less than an hour. The crowns above are from patients who came to our office seeking treatment. They were unhappy with the appearance of their front teeth. On questioning, they both indicated that they were in the chair for less than an hour. Needless to say, when we treated them, we spent a lot of time getting things right. Are you unhappy with your smile? Do you have a black line around your crown? Are you unhappy with the shade? We can help. Call us at (203) 799 – 2929 or visit this page to request an appointment. One of the most frustrating things for a patient (and challenging for us as dentists) is dealing with the loss of a front tooth. In many of those cases, our patients have to wear the “dreaded flipper“ for several months or more. No one likes a flipper – they can break easily, you can’t chew hard foods, they don’t look natural, and you can easily lose it. Due to a fractured tooth root and an infection, she lost her left front tooth. After months with a flipper, this is what we achieved! Photos and dentistry Dr. Nicholas Calcaterra. Our patient had to wear her flipper for several months while waiting for the infection to resolve and for the dental implant to become stable. On more than one occasion, she misplaced it, and then had to walk around without a front tooth! Kim’s flipper – along with the tooth model from which it was made. This is Kim’s flipper. You can see it is a single tooth attached to denture acrylic. It is fragile and can break easily. She did NOT like wearing it. Restoring a missing a front tooth on Kim with a dental implant and crown. Photos and dentistry Dr. Nicholas Calcaterra. As you can see above, we gave Kim her smile back using a dental implant. She is now able to talk, smile, and chew normally. 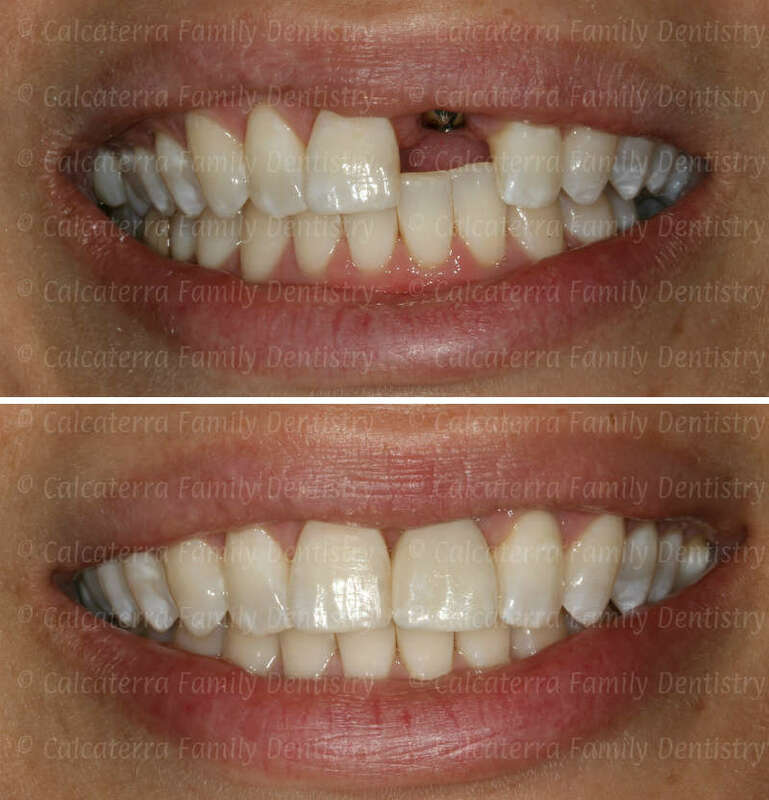 It took significant time and expertise to match the new crown to her existing smile. We think the results speak for themselves. Are you missing a front tooth? Walking around with a flipper but hate it? Call us at (203) 799 -2929 or see this page if you want to come in to see how we can help. In our office, we restore tons of dental implants. So naturally, we keep abreast of the latest techniques in creating teeth that look, feel, and function like real ones. And because we like to post so much implant information and photos on this site, we get lots of patients who ask us great questions. Recently, we’ve had a lot of inquiries on cemented versus screw-retained crowns. So we decided to do a post on it! Photos of screw retained implant crowns. She went from bare implants to two new teeth in 45 minutes. Dentistry and photos Dr. Nicholas Calcaterra. In the above case, you can see the screw heads peeking through the crowns in the second photo. We then placed a small filling over each screw head. She received two teeth in less than hour. By using this design, we did not need to use cement. 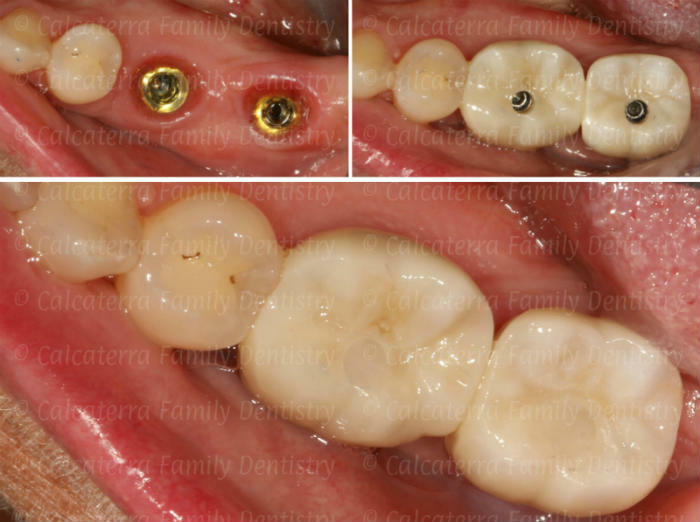 But why did we choose screw-retained crowns? 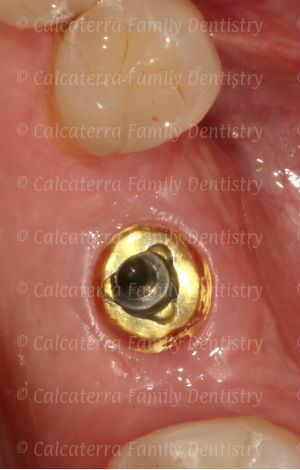 Excess cement around this implant can lead to failure. Retrievability: when a crown is cemented on, it cannot be removed without destroying it. So if there is ever an issue down the road, there is no easy way to address it without cutting off the crown. Implant Failures: research is showing that excess cement remaining on an implant after cementation can lead to implant failure. It can be difficult to find and locate all the excess cement that might remain. When a crown is held on by a screw, it can be removed within 5 minutes if there is ever a problem. And since there is no cement used, there is no potential for failure due to excess cement. So why not Use Screw-Retained Crowns all the Time? That’s a great question! In many cases, the screw hole can affect the esthetics. This usually is not an issue for back teeth like molars. 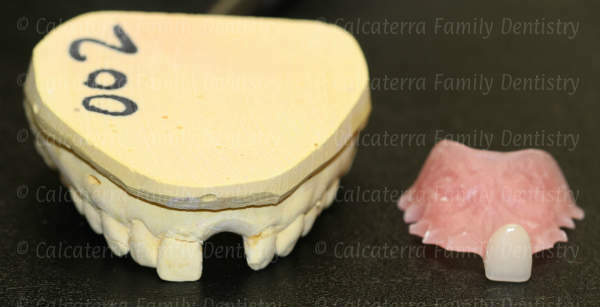 But when it comes to a front tooth crown, we have to take every single detail into account. 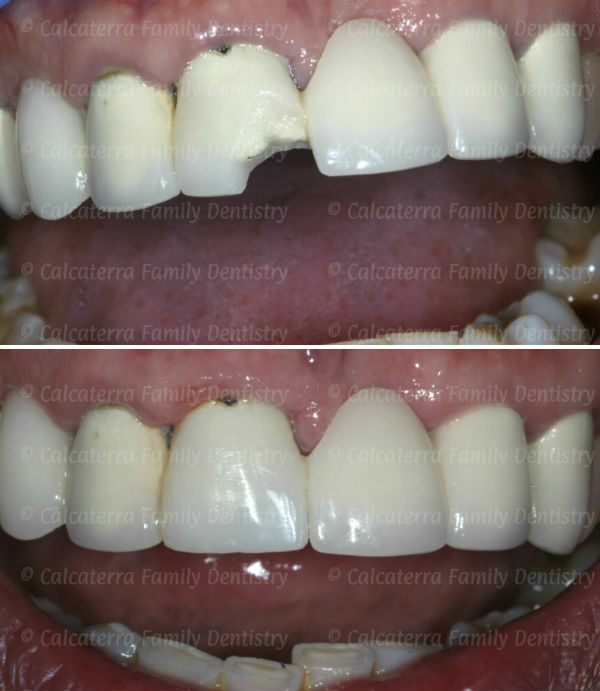 In restoring this front tooth dental implant, we had to use cement. Photo and dentistry Dr. Nicholas Calcaterra. In the above case, the screw hole would have affected the esthetics. And given that it is a front tooth – we want and need perfection. 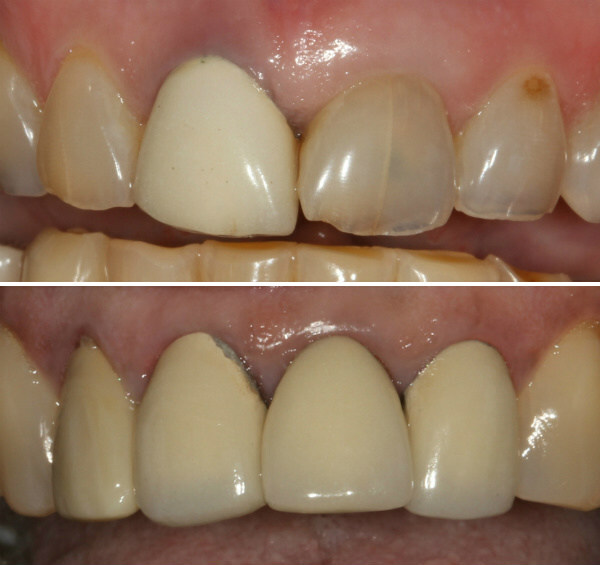 So in these types of cases we typically use cemented-on crowns. Are you interested in implants? Do you have an implant but not a crown yet? Call us at (203) 799 – 2929 if you would like to know your options. Reference on the the dangers of excess cement: The positive relationship between excess cement and perio-implant disease: A prospective clinical endoscopic study. Wilson TG Jr., Journal of Periodontology, 2009 80(9) : 1388 – 92).